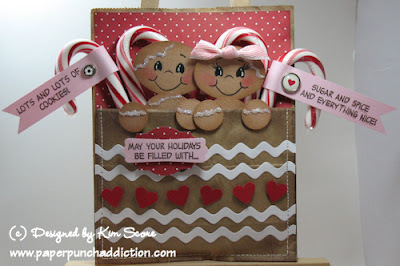 For our Peachy Keen Let's Face it Fridays Challenge #6, we were challenged to use a paper bag in a fun and creative way. I was a little stumped and then I saw this great idea on Beth's blog to sew a lunch sack into a treat pouch. Her instructions to make the pouch are HERE. I was happy to get out my PKS Snow Cuties 1 1/8" (PK-501) stamp set and make some little gingerbread people. Please be sure to jump over to the PKS Challenge site and check out the other great DT projects HERE. If you have some PKS face stamps, play along for a chance to win a Cricut cartridge and stamp set! 1) Create paper pouch following the instructions HERE. I attached the polka dot print paper on the inside back of the pouch before sewing the sides together. Sponge the edges of the pouch with chocolate chip ink. Die cut 4 strips of rac rac and glue to front. Punch out 6 hearts and attach with dimensionals. 2) Cut the tops off the ornaments for the heads. Sponge the edges of all caramel pieces with chocolate chip ink. Stamp Snow Cuties faces onto head. Apply regal rose ink to cheeks and add highlights to eyes with unibal white gel pen. Glue head onto top of body (at a slight tilt). Glue body onto back front of pouch. Attach hands to front of pouch with dimensionals. 3) Add dimensional paint for frosting and sprinkle with dazzling diamonds glitter. Tie blushing bride poly ribbon for bow on head. 4) Cut 2 strips of pink pirouette 3/4" wide by 5" long. Stamp greeting onto one end of strip. I used the greetings from Peachy Keen Too Sweet to Eat (PK-412). Wrap the other end around a candy cane and pierce or punch a hole through both layers. Attach a brad to hold loop together. L-O-V-E this idea, but you always have such wonderful creations. I would just love to use this idea for a gift card holder. I even concidentally have the PK 501 set you mention, for once I'm ahead of the game. Thank you so much for sharing! Love your blog, please keep up the great work! These gingers are the cutest! Amazing! TFS. Adorable!!!! Such a cute idea! These are so darn cute! Love all the embellishments...can tell this was made with lots of heart. I'm a follower now...please stop by and follow my blog as well...thanks! Adorable! They are just too cute. This is adorable. Thanks for the inspiration. These are adorable!!!! I always marvel at people who can take a few simple punched shapes and make something like this!